Sometimes, plant magic is as easy as simple substitution- swapping out a protein in an old favorite recipe, or changing to a vegan version of a condiment. Sometimes, though, the spell at hand requires some reinvention. Take a staple like tuna salad. One can pressed fish, some mayo, some relish, and lunch is served. I always enjoyed whipping up a quick tuna salad. Having it on top of some greens or on some crackers with soup is great for a speedy dinner or lunch that could be easily assembled from ingredients that were easy to keep on hand! Trying to recapture that same simplicity without the pressed fish was a challenge. None of my plant magic could make a substitute effective, especially while maintaining the convenience of the carnivormancy equivalent. Then, that re-invention impulse took over. I realized that I might be better off replacing the purpose of the salad, not the ingredients! While this doesn’t have *quite* the same flavor as the original, it’s just as versatile. It makes for a hearty and filling sandwich or wrap, and it’s still fantastic on top of salads or on crackers! The mustard and Worcestershire add that umami flavor, and mashed chickpeas let you go lighter than usual on the mayo. It’s also just as shelf-stable as the original, and easy to keep the ingredients for around for a lunch in a pinch! Using a fork, gently mash some of the chickpeas in a medium-sized bowl- the goal is just to break up some of the chickpeas to thicken the salad, not make them smooth! 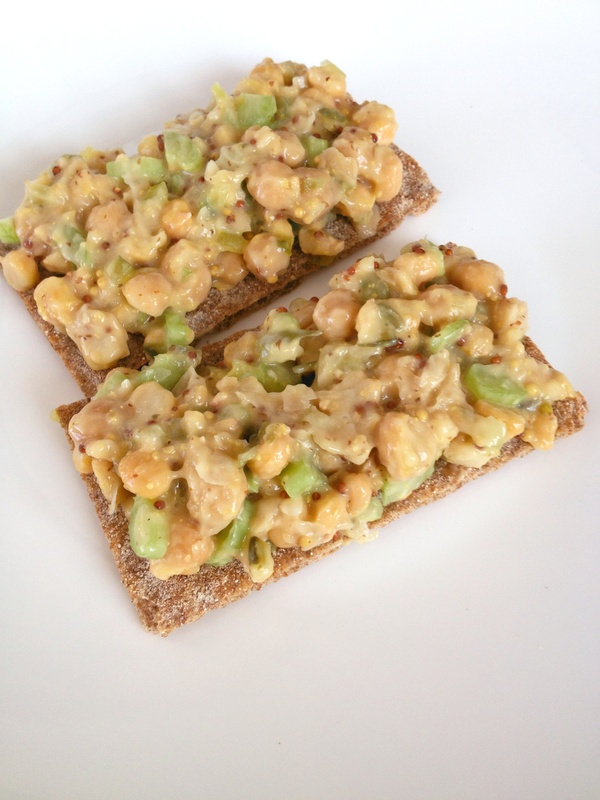 Serve on top of Wasa crackers, or with lettuce on bread… or whatever you usually do with tuna salad! This entry was posted in comfort food, on the go, quick dinner, simple and satisfying and tagged comfort food, easy, healthy, lunch, quick, simple, vegan. Bookmark the permalink.